Slightly edited version of article originally published under the title "Assad for OPCW!" Saudi Arabia, which has already sat on the United Nations Human Rights Council (UNHRC) since 2013, now heads one of its most critical panels. The news story looked even more bizarre than the one in 2010 announcing that Turkish President (then prime minister) Recep Tayyip Erdoğan had won the Al-Gaddafi International Prize for Human Rights. Saudi Arabia, which Douglas Murray at the Gatestone Institute realistically named the "world's human rights sewer," has been appointed head of a top panel of the United Nations Human Rights Council (UNHRC). The panel is – or maybe was – no joke: It selects leading officials for the task of shaping international standards in human rights and it reports on human rights violations around the world. Hillel Neuer, executive director of U.N. Watch, had a perfectly legitimate point about the news, which most people must have thought was a piece from The Onion: "It is scandalous that the U.N. chose a country that has beheaded more people this year than [the Islamic State of Iraq and the Levant] to be head of a key human rights panel. Petro-dollars and politics have trumped human rights." 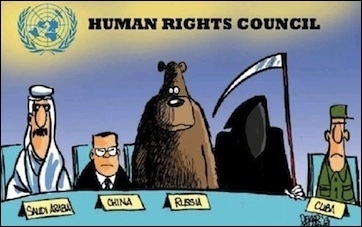 'Saudi Arabia' and 'human rights' are four words that should come together only in black humor. "Saudi Arabia" and "human rights" are four words that should come together only in black humor, if not unpleasant satire. But the words "Saudi Arabia and human rights" are now a bitter reality. Looking at the UNHRC's past records, no one should be terribly shocked, perhaps. Jagdish N. Singh forcefully reminded at the Gatestone Institute a line of similar black humor nature, quoting Navi Pillay, a representative by UNHRC commissioner, finding in a report that "when Palestinian men beat their wives, it's Israel's fault." Had the Saudis Wahhabis not been at war with rival jihadist groups, the UNHRC panel could have featured more colorful sessions with the participation of other human rights specialist groups such as Hamas, Hezbollah, al-Qaeda, and al-Nusra, al-Qaeda's Syrian franchise. Apparently the UNHRC is a very creative institution, adding to its standards of creativity every day. Maybe other United Nations organizations should imitate its innovative practices. Your columnist would suggest that Syrian President Bashar al-Assad should quit and be nominated for the chair of the Organization for Prohibition of Chemical Weapons (OPCW). Maybe then the OPCW could become an efficient organization like the UNHRC. The ideal chair for the Comprehensive Nuclear-Test-Ban Treaty Organization could be the Iranian president, Hassan Rouhani. Mr. Rouhani can be assisted in this position by his North Korean counterpart, Kim Jong-un. Both men can also act as rotating chairmen for the International Atomic Energy Agency. Speaking of North Korea, wouldn't the world be a safer place if this nice little country won a seat in the United Nations Security Council? Preferably a permanent seat. Not too much different than a UNHRC panel headed by a representative from a country where the debate over liberalism goes around the theme of whether women should be allowed to drive. There is too little room for dispute for the position of chair for the International Court of Justice. There is only one man among the world's most respected statesmen who would deserve the seat and he is Omar al-Bashir, president of Sudan. Entrusting the International Maritime Organization to a politician from Chad would further boost the political profile of continental Africa. Not enough for Africa? Someone from Niger as head of the United Nations Educational, Scientific and Cultural Organization, then. Had he not died, Pablo Escobar could have been a successful candidate for the chair of the United Nations Office on Drugs and Crime. In his absence, the job could be best performed by Joaquin "El Chapo" Guzman. Saudi Arabia and human rights .. The world is full of jokes. Sometimes the jokes are too bitter. But jokes are jokes, bitter or not. When President Erdogan's term ends, he should be nominated to chair Transparency International.